How do I de-cross-list a section in a course as an admin? 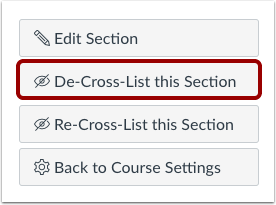 If you cross-listed a section from a course, you may be able to cross-list the same section back into the original course. This process is called de-cross-listing and returns all student enrollments back to the original course section. Once you de-cross-list enrollments, all grades and student submissions are removed from the course (since the course can no longer associate the information with any course enrollments). If you need to retain student grades and put them in the original course, you should export the Gradebook and import it into the original course before de-cross-listing the section. 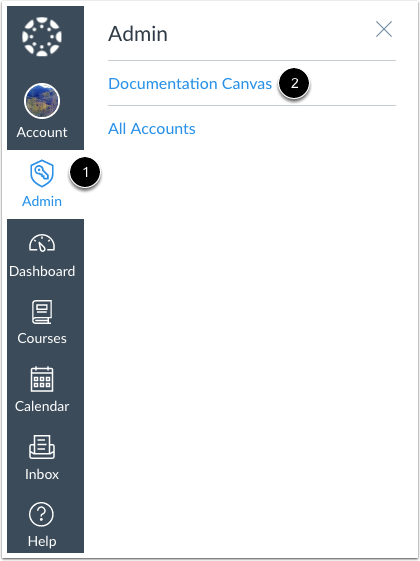 In Course Navigation, click the Courses link. Note: When you open an account, the account defaults to the Courses page. Use the filter and search options to find the course in the account. In the search results, click the Settings link for the course. Click the title of the section you want to de-cross-list. Click the De-Cross-List this Section button. Click the De-Cross-List This Section button. The section will be moved back to its original course. Note: If you de-cross-list a section that includes student grades, Canvas will include a message that all grades will no longer be visible. 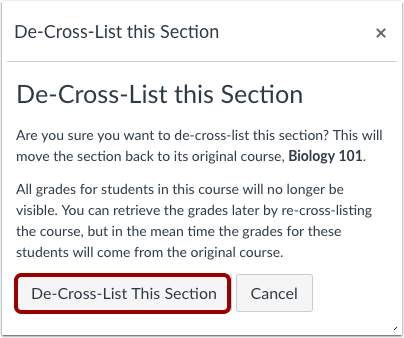 If you need to retain student grades and put them in the original course, you should export the Gradebook and import it into the original course before de-cross-listing the section. Previous Topic:How do I cross-list a section in a course as an admin? Next Topic:How do I conclude a course at the end of a term as an admin? 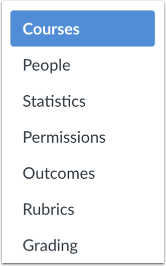 Table of Contents > Courses and Sections > How do I de-cross-list a section in a course as an admin?